With the ability to chose between the sound of four of the world's most popular wired vocal mics, powerful fourth-generation digital wireless technology, no compression or expansion to get in the way of your sound and up to 300' of transmission range, the XD-V55 handheld wireless from Line 6 provides the closest thing you'll hear to wired sound from a wireless system. 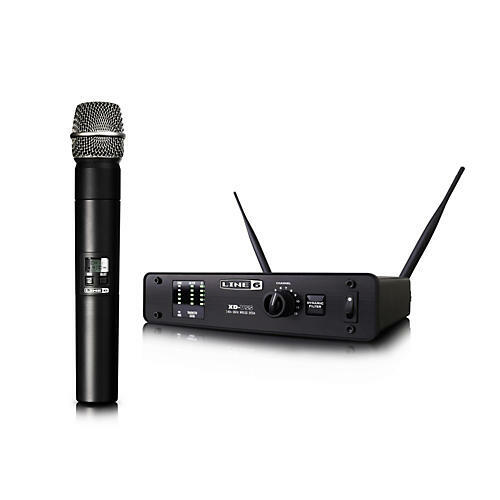 Operating in the 2.4GHz band, free of interference from other transmitting device, encoded Digital Channel Lock technology ensures your signal integrity to guarantee that every nuance of your vocal performance makes it through. Featuring a premium cardioid capsule engineered to capture your voice perfectly and deliver a full 10Hz-20kHz bandwidth at impressive dynamic range, you've always got the headroom you need for dynamic presentation.